People are being encouraged to take more train journeys armed with a free guide to watching wildlife in the "green corridors" of the rail network. Train companies, the Royal Society for the Protection of Birds (RSPB) and Mammals Trust UK produced the booklet, entitled Tracking Wild Britain. It describes the wildlife on 10 of the UK's most popular journeys. 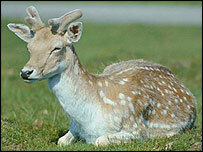 The common buzzard and fallow deer are examples highlighted in the guide, available at stations and online. The Association of Train Operating Companies (Atoc) says around 220 species of bird and 65 species of mammal can be seen from key rail routes. Stuart Hall, of Atoc, said travelling by train helps conserve wildlife because rail routes provide "green corridors". "We hope this guide will encourage more people to travel by train and help make rail journeys even more enjoyable for our passengers," he added. Environmentalists say they will remind the industry about the "green corridors" claim next time there is pressure to fell trees, because of leaves on the line, the BBC's Tom Heap says. Have you spotted wildlife on a rail route? Did you take photos? The RSPB and the Mammals Trust hope to encourage both children and adults to take an interest in wildlife near the tracks. 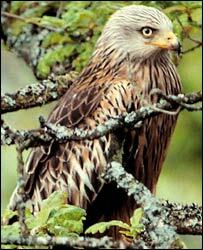 Bryan Bland, of the RSPB, said trains gave access to more wildlife than road vehicles. And Jill Nelson, chief executive of Mammals Trust UK, said she was "delighted" with the guide. "We hope that the booklet gives readers an appreciation for all of the exciting wildlife we are lucky enough to share our environment with." A spokeswoman added: "There may be some areas of the routes where the speed of the train would make it more difficult to spot wildlife. "However, it is generally the slower sections of the routes where people are more likely to spot mammals and birds, so travellers should still have plenty of opportunity to track wild Britain."